I have been a devoted Google Reader user for years, so, like many, I was devastated to learn that they are shutting down this service. 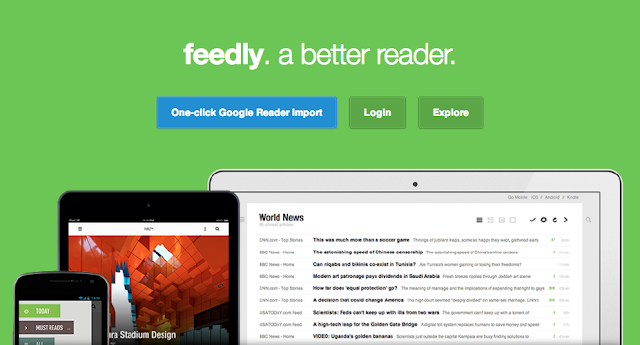 I wasn't happy about trying out and finding a new reader program but about a month ago I started using Feedly. It was nearly love at first click. With one-click migration I literally migrated my Google Reader subscriptions to Feedly in no more than a minute. The interface is sleek and smooth with a variety of options for viewing subscribed blogs. A few minutes later I had the Android app installed on my phone and was impressed with how quickly I was won over. A month later I am still lovin' Feedly. If you are still on the fence about which reader to use (hurry - Google Reader retires on July 1!) I highly recommend Feedly. I know that all the blogs I follow have been endorsing BlogLovin' but I have already fallen in love with Feedly and although I haven't tried BlogLovin' I know it just isn't going to make me as happy as Feedly has. The point of having a reader is to easily follow all those awesome blogs out there - they make blog following so much better - so, no matter which one you choose just make sure to get your subscriptions moved over before Google Reader goes offline. Like you said, feedly is really smooth and easy for using on my phone. I will still use GFC and go through blogger dashboard on my laptop or seeing posts, but I have a feeling I'll be using both bloglovin and feedly on my phone and ipad. I did the exact same thing -- went with Feedly first and haven't looked back. Glad to see I'm not the only one out there who isn't lovin BlogLovin! I too moved to Feedly a while back, and I love it! I was beginning to feel a little left out with everyone moving to Bloglovin', so it's nice to hear there are others using Feedly too!